Bag Game is an interactive app for iPad and other iDevices (iPhone, iPod) that brings the game of "20 Questions" to the iPad format. Using Bag Game (the folks at all4mychild emphasize that it is a social game that can't be played alone) children can choose an object from various categories, hide it "in a bag" and engage in a clue-giving/guessing process with another child or you as the therapist. Question prompts are provided (e.g. "Is it in the ___ group?") that also function as a question/clue tally and gear the game toward the use of Yes/No questions. However, this activity can easily be modified to target use of key semantic attributes, with the "hider" providing clues about category, function, location, associations, and appearance to a communication partner. Guessing games of this type address a number of objectives, including semantics, listening, question formation, turn-taking and other social-pragmatic skills. I really can't think of anything but positive things to say about this app! It's simple, yet addresses a complex and key skill that students need repeated practice with. I have used it with kids at various grade levels and they love it, from the selection of the adorable illustrations to "bag," to the "pinching" effect that "opens the bag." The categories and category items are generous, such that the app could be used to target basic categories (included: animals and food, in various subcategories, sports equipment, appliances, instruments, tools, vehicles). Most of all, I am not a "stuff guy" and I would likely never endeavor to play a real "bag" game, with the exception of the activities that come with the Talkies program, so this app caters to my need for simplicity. Speaking of Talkies, this app, with its hidden object context, could also be used to target visualization as a language strategy. 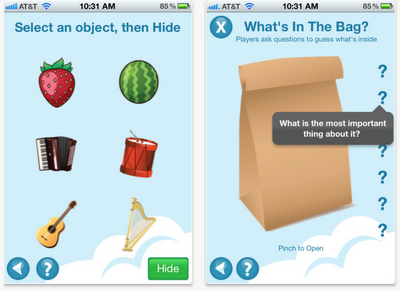 Bag Game is also featured as part of all4mychild's terrific Social Adventures app, an e-guide to targeting social interactions through fun games, activities, catch phrases and visual cue cards, but as a stand-alone, the price is totally right at $1.99.